Marvel, you make me sad sometimes. You make an event like Age of Ultron, and it just makes me really sad. I spend my money on your series and you proceed to go in the absolutely incorrect direction with it. Even after reading everything, I just wonder “Why would you make this story?” as my general reaction. I’m not angry about the way Age of Ultron went, but like many other people who read this series I’m just very sad, disappointed, and perplexed about the entire story as a whole. I think I’ve managed to pin point the exact reasons why I’m so bothered by this story though. There will be spoilers, so avoid reading any further if you care about them (although you shouldn’t). If you’re looking forward to seeing an awesome scene like this in the series, prepare to be disappointed. Age of Ultron was hyped as a very cool and fun story where heroes are in a post-apocalyptic world where Ultron rules everything, similar to how Age of Apocalypse was, only with Apocalypse instead. In interviews, Bendis and other people involved also talked about this fact, discussing how the heroes are going to try finding a way to defeat Ultron, talked about the significance of characters like Moon Knight (who had no significance), and about how this world of Ultron’s is so bad and we get to explore it and watch the heroes find a way to beat him. And it became clear halfway through the series that all of these things were said to mislead us into thinking this was an Ultron story. 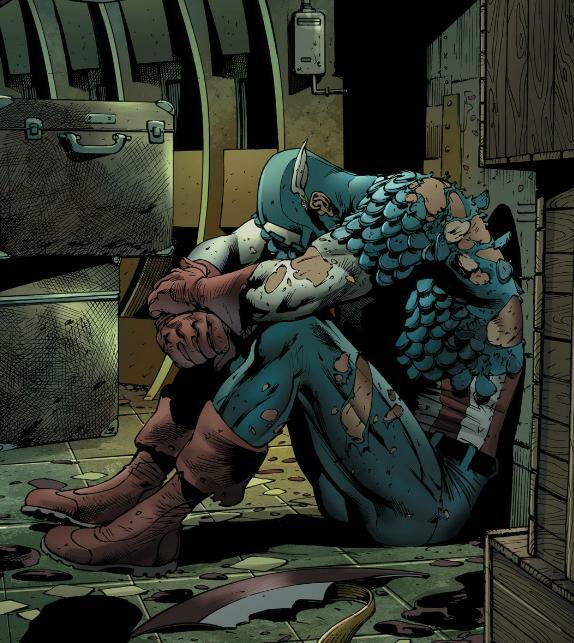 Captain America after reading Age of Ultron. Okay, so if it’s not about Ultron, what in the world could Age of Ultron be about, you may ask. Oh, well let me tell you all about it. Age of Ultron turns out to be a story where all of the heroes run around in an alternate timeline where Ultron rules everything. Along the way, they fail to do anything for six issues but die. But Wolverine decides to go to the past to kill Hank Pym with Invisible Woman so Hank can’t create Ultron. And then Wolverine and Invisible Woman are in another alternate future where Tony Stark is evil and crazed and fighting Morgan Le Fay. And then everybody decides not to kill Hank Pym in the end. After that, Hank Pym uploads a super virus into Ultron given to him by crazy alternate future Tony Stark to kill Ultron next time they fight him. Oh, and now timelines and universes are messed up. So who is underwhelmed just by that description? Because had I been told that beforehand, I wouldn’t have bought all ten issues in the series. So let me explain why all of this is very, very wrong and not fulfilling. 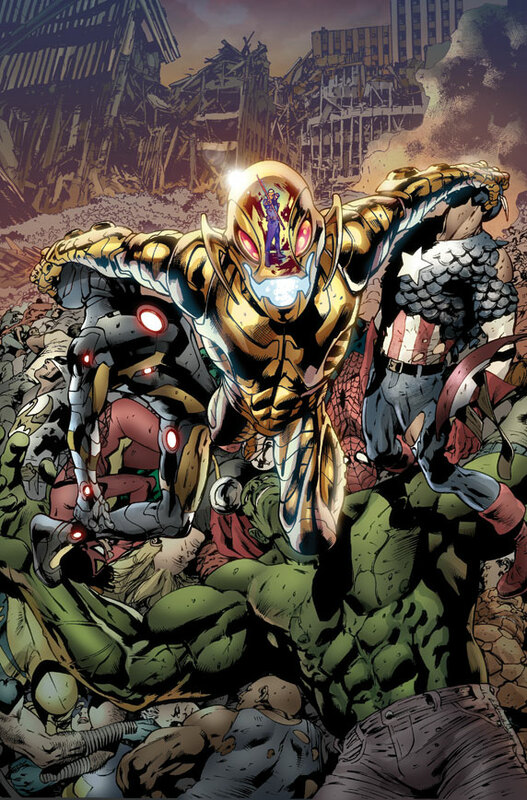 We’re shown a world where Ultron rules, and we see a select number of heroes trying to stop him. Sure, this is cool. They do a really good job showing what a world under Ultron rule is like. 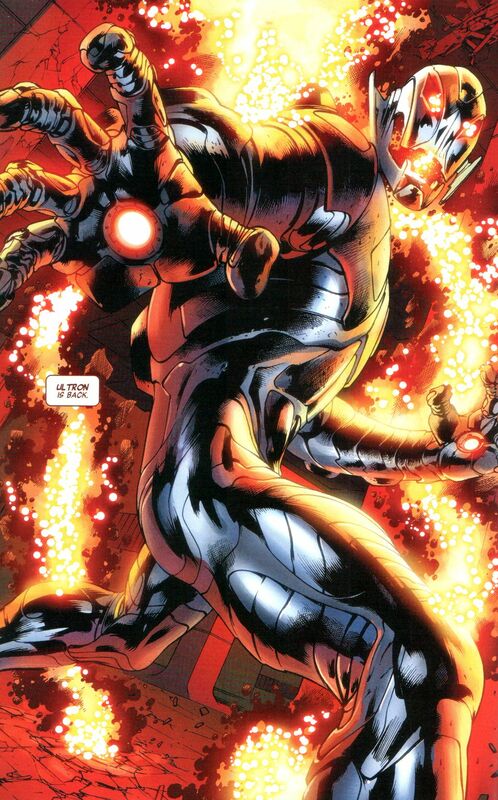 So naturally, we’re expecting the heroes to do some cool stuff and fight back against invincible odds to beat Ultron. Except we don’t get that. We get a ton of stuff around the United States where heroes run around trying to find information on Ultron to defeat him, and everyone ends up dying or killing each other. Why? Because showing all of the heroes dying is supposed to be really surprising, except it really isn’t when the story is that almost everyone is dead already. And considering that all of these deaths are absolutely worthless, there is no sense of tension involved. But I guess it gives someone the excuse to draw a picture of Captain America getting his head vaporized, so it’s all worth it in the end, right? 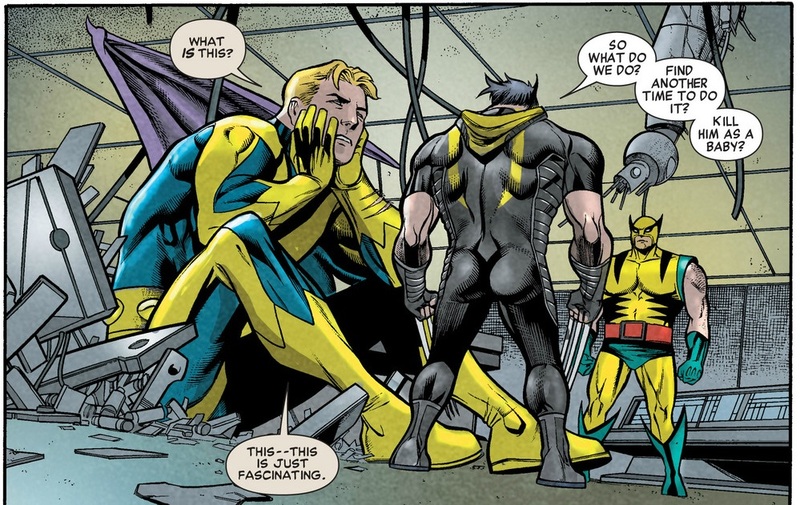 As you can tell by Hank Pym’s expression, he is being entirely sarcastic. Now because everybody fails and they do an outstanding job of making sure nobody has a real plan to defeat Ultron, there is absolutely nothing that evokes any sense of success for anybody. I mean, their final plan is to unplug Ultron. What kind of joke of a plan is that when you see how devastating Ultron is already? These idiots deserve to die if that’s the best they have. And God help me, Wolverine of all people is the only guy to make sense of anything and says, “Hey, we should use this totally random time travel device to go and kill Hank Pym in the past.” I mean, it’s still a monumentally awful plan, but it’s better than the crap that every hero in the world is trying to come up with! But no, they all decide to charge Ultron’s base without a real plan and everybody dies. Shocking stuff there—really. So now this story stops being about Ultron and his universe. It’s about Wolverine and Invisible Woman going back to kill Hank Pym and screwing up the timeline. This is basically what nobody would probably ever be interested in reading about. To make things worse, killing Hank Pym takes Wolverine and Invisible Woman to a completely different timeline where Tony Stark is all evil and Morgan Le Fay is the ruler of everything. But hey, we got a unique group of Defenders that are all different now, so I guess that’s supposed to make it all worthwhile (it doesn’t). So with this pointless diversion, Wolverine has to go into the past with Invisible Woman to make sure Wolverine doesn’t kill Hank Pym, thus screwing up the timeline even further! Gee, this timeline story in my advertised Ultron story is really welcome. Behold the most pointless alternate universe team ever assembled. But here’s the new plan: we have Hank Pym insert a virus into Ultron and make him forget about it until present day. And then Hank Pym will see a video in the future just before Ultron goes crazy and takes over the world telling him how to activate this virus and take Ultron out. This is our plan. Even by comic book logic, this is absurd. And in the final issue, Hank Pym activates the virus and forces Ultron to go berserk, which allows the heroes to destroy him. Only now we see things such as the regular Galactus in the Ultimate universe, alternate versions of characters going bonkers, and then Angela. Yes, they featured Angela as the giant reveal for the very last page of this story. However, if you said “Who the hell is Angela?” then you are like 95% of people who read this book! 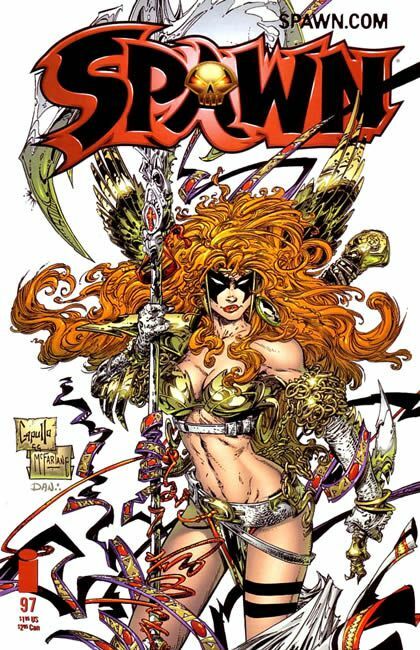 There is no reason for anyone to care about Angela being in the Marvel universe, but they still try to make it a big deal! What do you mean you’re not excited about every female 90’s character ever? What is so painful is that this story could have been told in probably three issues if they didn’t waste time with showing off everybody dying constantly, pointless side plots, and alternate Tony Stark world. We didn’t need most of this stuff to stretch out this story, and it all just felt like filler. Speaking of filler, the crossover issues? Completely and utterly pointless. 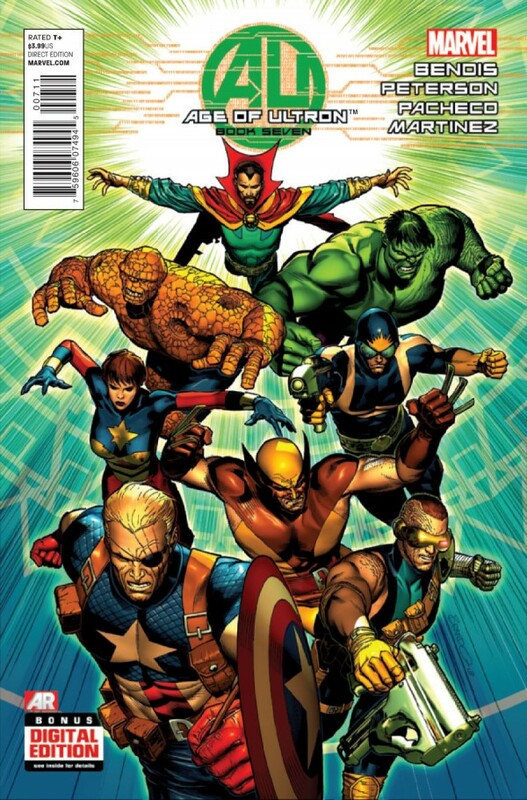 They tell a more elaborate story to an Age of Ultron world that is barely even the focus of anything. But I guess if you want to know why Invisible Woman is the only one alive in the Fantastic Four in this alternate universe where everyone dies and there’s no other chance of it being significant, this can be exciting for you. And the Superior Spider-Man crossover? Considering that the Spider-Man in Age of Ultron is actually Peter Parker and the crossover issue is Doc Ock, I’d say this one is extra pointless. So there you have it, folks. That’s why Age of Ultron completely sucked as an event. It’s obvious that they wanted this to be the Avengers version of Age of Apocalypse, but somewhere along the line they forgot what made Age of Apocalypse so fun was that it led to actually defeating Apocalypse in the end, so that all of the deaths that happened were meaningful. Instead, all tension is lost when Wolverine and Invisible Woman try to mess with the timelines, thus rendering everything we saw for the past six issues completely meaningless. What future ramifications Age of Ultron will have, I’m not sure. All I know is that I’ll be thinking twice before I try out another major Marvel event again, even if I really like the concept of it. Issue 10, Page 9. This is really the first time we see Ultron.